Sooke’s salmon fishing was a mixed bag last week. A few slow days, and then some really nice fish in between, a few 30 pounders and even one 40 pounders! The big fish was taken at 70 feet on a blue anchovie teaser head. So…definitely worth getting out there and giving it a go. 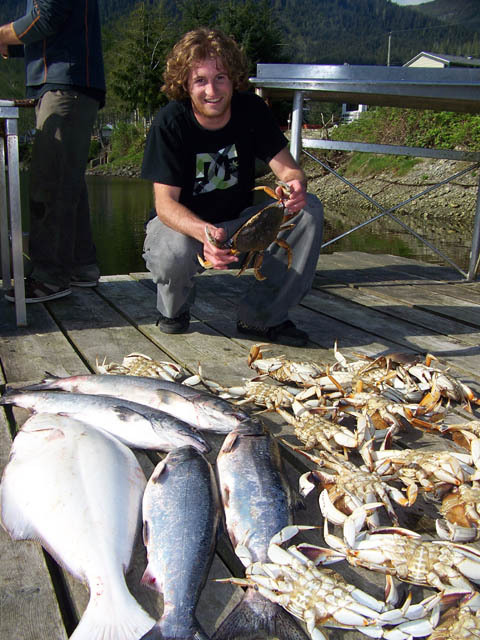 Crabbing in Sooke Harbour is quite good, lots of good size Dungeness crabs. Trevor from No Bananas Fishing Charters reports: “well it looks as though fishing has slowed a bit, we did not see many fish caught in the last couple days. But we thankfully got lucky with the magic combo: purple haze squirts with purple glow flashers. Here’s a couple pics, first the Magivern group with a limit up to 19lbs, then Doug Carter with a 25lbr from Saturday morning (we landed 20 fish in five hours! I guess even a blind squirrel finds a nut once in a while). 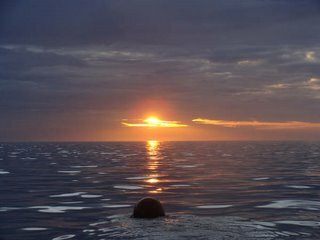 Some beautiful sunrise shots too”. Great report, thanks Trevor! 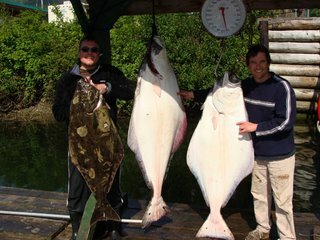 Jolly Rogers Fishing Charters had a good halibut day, catching three good ones: 110 pounds, 95 pounds, and 40 pounds. His guest, Dale from Australia, reports a “personal best, any species”. Nice! 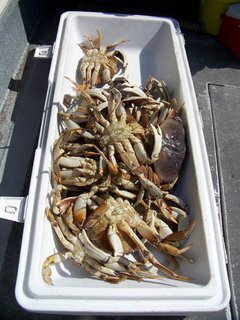 Crabbing is still fantastic, big Dungeness crabs, hard shells, very sweet. Last week saw some excellent salmon fishing in Port Renfrew, with fast and furious Chinook salmon action. The fun continued into the weekend, where it slowed down a bit…steady, but not as crazy good as it was. Perhaps the run has passed by…but who knows when the next one will arrive? The only way to be sure is to get out there and try! 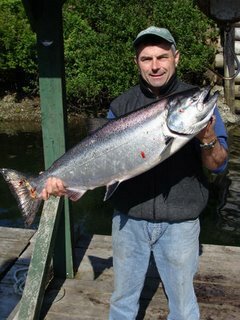 Jolly Rogers reports a few fun days as well, with quick action for Chinook salmon 10-20 pounds, and up to 28 pounds. 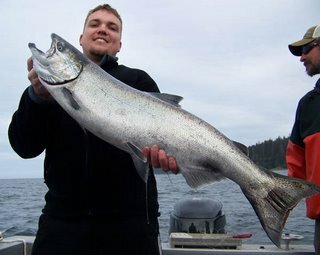 Trevor from No Bananas Fishing Charters had a good couple of days, limiting on halibut in Victoria, then the next day fishing salmon in Port Renfrew. His guests limited out with 8 spring salmon to 25lbs. 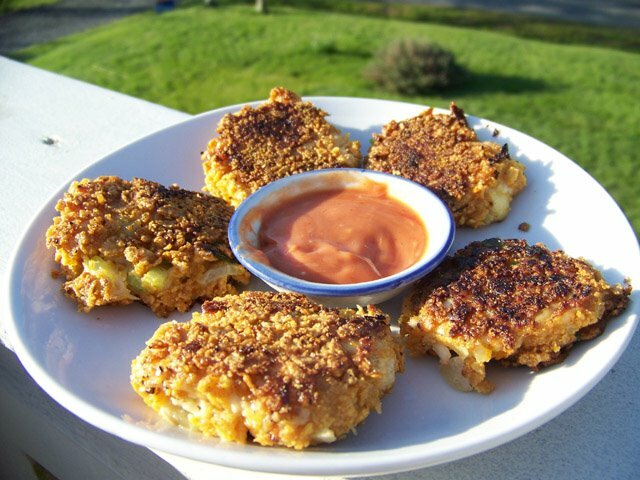 There is not a lot of halibut fishing to report, with the salmon so good. There have been a few halibut here and there, mostly closer to shore caught at anchor. No reports yet from Swiftsure Bank…but they will be coming soon. The crabbing in San Juan Harbour continues to be amazing with multiple limit catches and the ability to be very picky in only choosing the biggest hard-shell keepers. And just to get you thinking of the fun to come, here’s a picture of a 52 pound Tyee salmon caught in Port Renfrew in ’07 by guests of Seawind Fishing. How about that! The lucky angler is Hessel, from Holland. Get out to Port Renfrew and get those lines in the water! 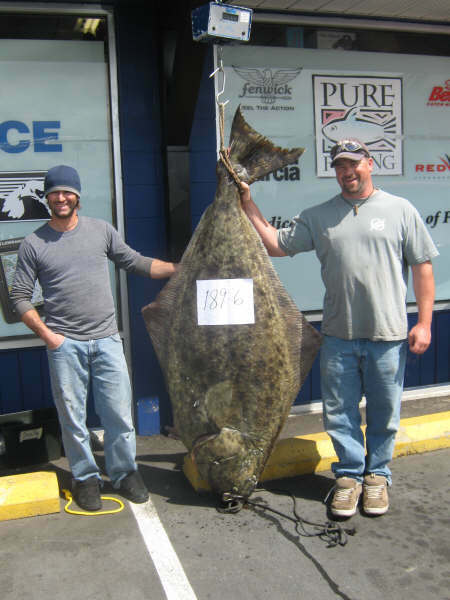 Desi from Vicious Fishing caught a 189.6 pound halibut, putting Port Renfrew atop the Island Outfitters leader board (where it belongs). Apparently the fight was all the more challenging because a sea lion was pulling at it from the other end. Jolly Rogers had a couple more fun days spring salmon fishing between Owen Point and Camper Creek, catching limits of Chinook salmon up to 28 pounds. Trevor from No Bananas Fishing reports Port Renfrew’s fishing and crabbing as “spectacular to say the least. Both days we limited on halibut very quickly by anchoring up off Carmanah. Then on to salmon off Owen Point and I can’t remember better fishing for this time of year…salmon up to 25lbs and the crabbing was unreal. All and all it’s about as good as it gets anytime of year… put into the mix there is almost no boats right now and you have magic”. 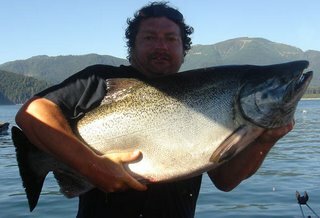 Vancouver Island fishing at its finest! With the nicer weather, fishing efforts are increasing around Port Renfrew, with more boats arriving for the season. Halibut catches are steady, in the 30-50 pound range, with some bigger. Early season halibut fishing tends to be at anchor closer to shore to the west of Port Renfrew…fewer bites than Swiftsure Bank, but bigger fish on average. There’s a few monsters waiting out there in the secret spots….JR has a few tricks up his sleeve. Port Renfrew’s early season spring salmon fishing has been excellent, with limit catches of medium sized chinook salmon right out front of the San Juan Harbour, between the whistle buoy and East Point. Salmon action in the 10-20 pound range is fast and furious towards Camper Creek too — find the bait, and the salmon will be there too. If the early season fishing is any indication of what’s to come, everyone is very hopeful for an excellent salmon fishing season ahead. The crabbing in San Juan Harbour is outrageous…limit catches in every trap, 7-8 inch hard shell Dungeness crabs. SO sweet. Expectations are running high for a great Chinook return and if the last few weeks are any indication we would have to agree. Lots of limit catches coming from the can buoy from 40-85 feet deep on any needle fish pattern. 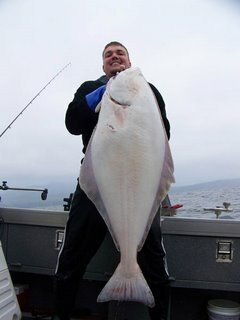 Halibut fishing is very good with quite a few in the 80 pound range and a couple even larger. 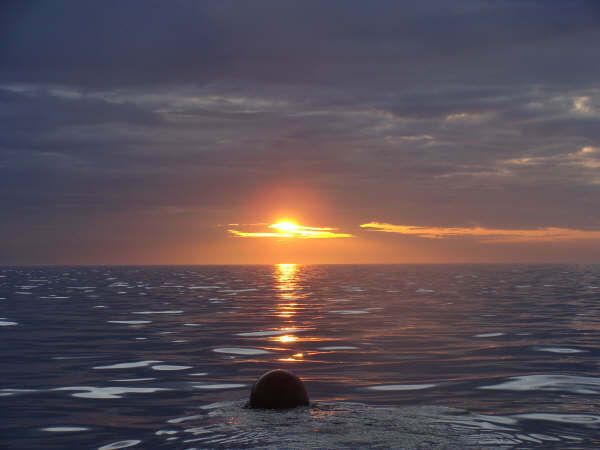 The weather is still a problem this early in the year so leave prepared and informed of sea conditions. Crabbing is the best we’ve seen!! Limit loaded traps are the norm right now. Fresh and sweet, the first of the year can’t be beat! Here’s a picture of some super tasty Port Renfrew Dungeness Crab Cakes…recipe coming soon. Sounds like it is time to get out to Vancouver Island’s west coast and get going on some Port Renfrew fishing adventures of your own! 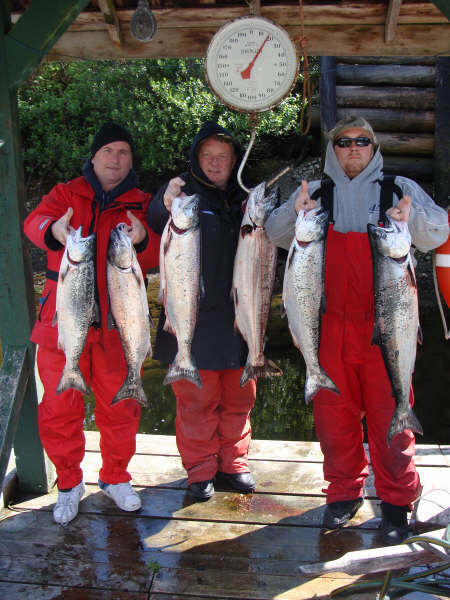 You are currently browsing the Port Renfrew Fishing Report blog archives for May, 2009.